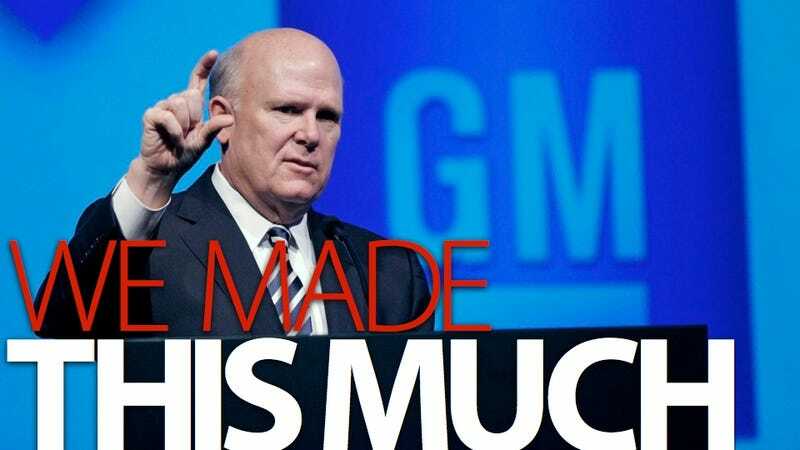 General Motors says it made $510 million in the fourth quarter and $4.7 billion last year in net income on revenues of $135.6 billion. It's the first time an automaker named General Motors has posted a gain since 2004. Looks like President Obama's ex-car czar Steve "Chooch" Rattner was right about at least one thing — the new GM seems absolutely set up to "mint" money. The just-out-of-bankruptcy automaker's adjusted earnings before interest and tax (EBIT) was $7.0 billion for the calendar year. Automotive cash flow from operations was $6.6 billion with automotive free cash flow at $2.4 billion thanks to a $4.0 billion voluntary cash contribution to the automaker's U.S. pension plans. Want more info? Click here for the press release.